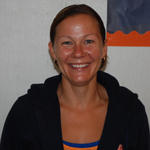 Jennifer Ragazzone is an important piece to Lemon Bay High Schools puzzle. Aside from teaching at Lemon Bay, she has the experience of educating all levels of students. Ragazzone taught fifth and eighth grade at Laurel Oaks Academy in Port Charlotte. She teaches geometry, Algebra I and II, and Math for College Readiness. Ragazzone is originally from Iowa but has lived in Florida for most of her life. Ragazzone is a Lemon Bay and a University of Central Florida graduate. I graduated from Lemon Bay and was excited to get the opportunity to come back. She has a Bachelors of Science degree, but she hasnt always taught math. For three years she taught English. There isnt any other subject that I would teach. I love math. She is also the JV volleyball coach. Even though she spends a great deal of her time at school, she still seems to make time for her girls, Madison, Lauren, and Isabelle; her children influenced her to begin her teaching career. Other than spending the majority of her time with her family, she enjoys boating, fishing, reading, and playing Sudoku. She is a role model teacher and loves working with teens and wants to motivate her students to walk across the stage with a diploma in their hands. Her advice to students who are interested in becoming teachers is, "Don't give up; stick with it because there is no job that is more rewarding than teaching." One way Ragazzone keeps students interested in the classroom is to incorporate reading strategies into math. She doesn't like to lecture a great deal because she knows it bores them, and they can easily lose interest. She wants students to have time to ask questions and be able to get help in order for them to succeed in her classes. Ragazzone loves teaching and hopes that she makes a difference in her students lives and wants them to enjoy math after leaving her class. Ragazzone is a role model teacher, mother, and friend.